“My saddle sits up on my horse ‘like a party hat’!” We heard this descriptive analogy from one of our customers who was on the search for a saddle to fit her Warmblood mare. In our goal to deliver expert saddle fittings we’ve had a lot of practice trying to find the best saddle to fit the generously built horse. 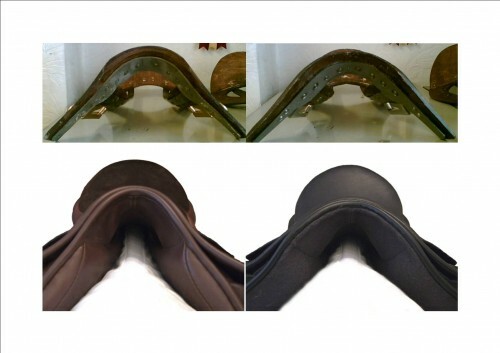 Here are some of the issues that we face, and some solutions that allow us to offer the best saddles for sale. This saddle is too narrow a fit for this horse. Note the space between the the pommel and the horse’s wither. Stability is always a challenge. Saddles tend to slide on round horses. The saddle tree is the frame of the saddle that helps to secure it to the horse’s back. A tree with long ‘points’ can offer more stability, but can also create more of an opportunity for pinching. Short points may be more comfortable for the horse, but may necessitate a more secure rider, careful padding and girthing to stay put. Our most successful saddles for the wide horse are built on a tree that has more of a ‘U” shape than a “V” shape. The bottom line is that many wide horses are shaped more like a table than a tent. No matter how wide you expand the bottom of a “V”, if you are putting on something shaped like a circle, there will be only a small area of that tree that will contact the horse. The “U” shaped tree tends to be much more forgiving and allow more room for the top of the shoulders. It seems that many wide horses are also short coupled. Note how the saddle sits up in front with the pommel higher than the cantle. This is an indication of a tree being too narrow for the intended horse. It is sometimes necessary to use a ‘point billet’ (the girth billet comes right off the end of the tree point, with a very forward placement). This tends to be the most secure girthing system, but also can create the most pressure at or right behind the shoulder. It can be the best way to keep a saddle ‘back’ and keep it from riding forward, but the down side is that it can pinch. Some horses carry a lot of their width lower down in their shoulder area. The tree points do not affect this area as much as the front of the panels of the saddle. Many of these horses do not care for a forward flap that gets onto the shoulder, but likes a straighter ‘dressage’ flap better. This can cause some difficulty in choosing a jumping saddle, especially for the long legged rider, or the rider who prefers to ride in a short stirrup with a more forward leg. Sometimes a very softly flocked panel can be a compromise. The gullet or channel of the saddle is another factor that affects these rounder horses. Generally, we like to see a generous amount of space between the panels- 2 ½ inches or greater. If the gullet is too narrow, it can produce pressure on the spine and adjoining structures, but too wide a gullet can also produce stability problems. It is unfortunately true that many of these wider horses have sustained damage and discomfort from a pinching saddle. Since horses have such good memories, they don’t tend to forget that distress. Even when you put a better fitting saddle on them, they may harbor some resentment and be less than thrilled with anything that you offer them. Above: (Left) Standard head tree, (Right) Freedom Head tree. Lower photos show both trees in a completed saddle. Note the differences in angle of the tree points. One can see how the broader, more “U” shaped tree head on the right would accommodate a wider, flat backed horse more comfortably. The final part of the challenge is to find a saddle that not only fits the horse, but is also comfortable for the rider. In theory, the tree width does not directly correlate to the width of the ‘twist’ of the saddle, but in reality, there is a relationship. In order to take a very broad ‘foundation’ and have a narrow twist, the saddle will have to have some thickness to the panels in order to meld the wide tree that is necessary for the horse’s comfort to the narrow twist that is necessary for the rider. Once again, let’s picture that ‘V” shape, but this time, think of where your legs tie into your hips. If you are narrow hipped, the only way that you can comfortably straddle that ‘table shape’ will be to allow a bit more bend in your knees and allowing your thigh to come forward slightly. One of the biggest challenges that we have is trying to work with a rider who is insistent that their legs must hang down long and straight, while they are trying to ride an extremely wide mount! Some saddle trees are actually thinned and shaped away from the area that your thigh will encounter. This can be more comfortable, but do remember, there are always trade offs, and generally the panels that support that tree have to also be shaped and smaller in their weight bearing surface area. The Mono Flap, or single thickness flap can be more comfortable for a rider who is already trying to struggle their way around a big-barreled horse. It eliminates one layer of leather between you and your mount, and also offers a close feel. We’ve worked with two of our saddle companies to create saddles for these round horses. Our Equinox saddle, made by Black Country in England, has found great success and popularity in the endurance and pleasure riding world. Comfort is of supreme importance for these athletes, and the ‘hoop’ shaped tree that we used is coupled with a very soft Jacob’s wool flocked serge panel. For the dressage riders, The Eloquence Extra, is built on the same tree as our ‘Equinox’, and incorporates all of the features that have worked so well for distance horses, but, of course, we offer the look of a more traditional dressage saddle. If you need to jump fences, take a look at the Killingtons. 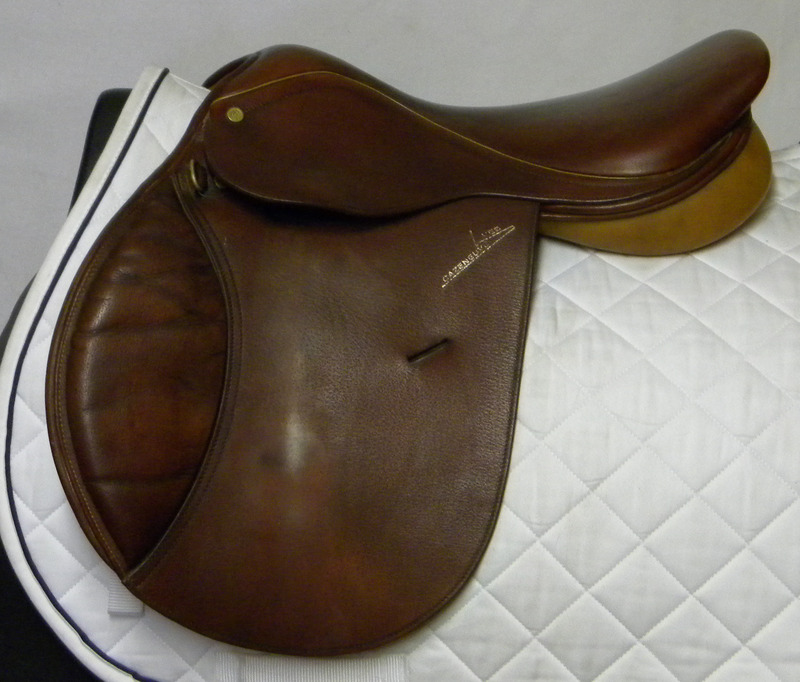 These saddles are also made for us in England by Alan Powell and Paul Booker, and have gotten kudos from many different saddle fitters in the US as being easy saddles to fit and custom flock, if necessary. They have gained popularity as foxhunting saddles; the panels offer a wide, generous weight-bearing surface, with a wide gullet. In addition, we recommend that you consider the Duett Saddles. The owner of this company rides Haflingers, so she has first hand knowledge on fitting a broad horse. 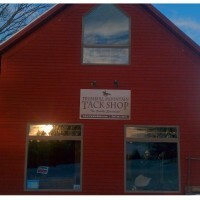 She offers several models, including an excellent trail saddle, an all purpose saddle and dressage saddles. Please don’t be tempted into saying ‘as long as it fits my horse, I’ll learn to ride in it.’ In order for you to give your horse every chance to progress in his work, you MUST feel comfortable. We all know that a horse that isn’t comfortable can’t do his best, and neither can you. It can take a lot of experimenting to find a saddle that is right for both of you, but it is truly worth the wait and the many dollars you can spend on shipping! Be prepared for some frustrations! It is not an easy process to find the saddle that both you and your horse will be happy with, but it is worth the effort.